Gov. 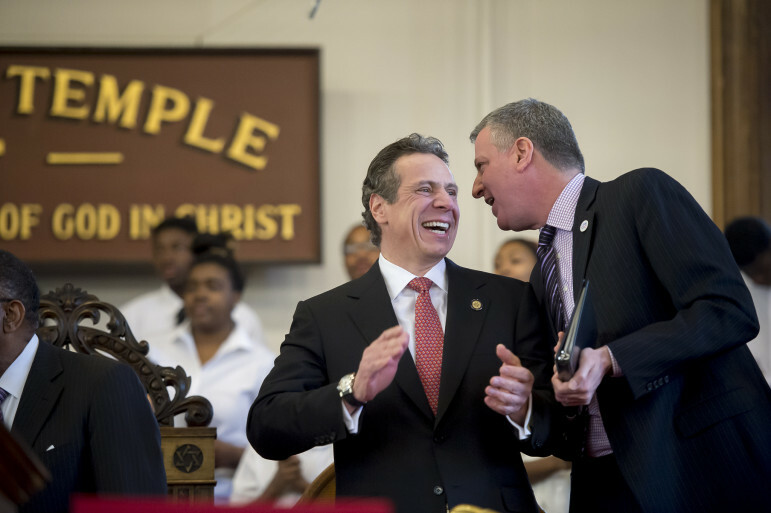 Cuomo and Mayor de Blasio chuckling in a February 2014 photo. Their disagreement over 421-a has been less hilarious. Several months ago when the dual deadlines for the expiration of rent regulations and the 421-a loomed on the horizon, it was unclear whether their fates would get bundled into a grand (or not so grand) compromise. Now, that seems to be exactly the ending to which Albany is lurching six days before both programs expire on June 15. Over the weekend, Mayor de Blasio said if rent regulations weren’t strengthened and 421-a reformed in the manner he has proposed, the tax break should end. Most of us understand roughly what 421-a is—a property tax break on multi-unit residential buildings started when the city was desperate for any kind of development and tweaked over the years to try to encourage affordable housing. And the critique of 421-a—that it costs the city too much in foregone tax revenue and produces too few units of affordable housing—is well known. So is the developers’ rebuttal: that without 421-a, a lot of residential projects would never be built, costing the city market-rate units and the economic activity generated when they’re built. 1) Why is it called 421-a? Because that’s the section of the state’s Real Property Tax Law that established the exemption. 2) When did it begin? It was first passed in 1971, then updated to include affordability provisions in 1984. There was another set of changes over the 2006-2008 period meant to increase the affordability impact. 3) How much does it cost? In fiscal 2015, the city tallied $1.1 billion in foregone property taxes on the 62,000 properties that received the benefit. Getting a 421-a exemption doesn’t mean a property pays no taxes; it means they are exempt from paying some or all of the taxes resulting from improvements they make to the property. The amount of the exemption shrinks over time and, in some cases, the 421-a break only applies to some of the increased value: If the property value goes above that cap, the owner pays taxes on the excess. 4) Who runs the program? Projects are deemed eligible by the Department of Housing Preservation and Development (HPD), although the actual tax exemption is administered by the Department of Finance, which oversees the property tax system. 5) What’s the Geographic Exclusion Area? This is the part of the city where getting 421-a benefits requires that you provide affordable housing. The area was expanded as part of the 2006-2008 reforms to cover the entirety of Manhattan, large swaths of northern Brooklyn, parts of western Queens, the northern strip of Staten Island and a couple chunks of the central Bronx. Here’s a map. If a property is inside the GEA and in Manhattan below 110th Street, the owner has to support or provide affordable housing to get any benefit. He can qualify for a 10-year benefit if he holds a “negotiable certificate,” a remnant of earlier versions of 421-a in which developers at one affordable housing site would subsidize their units by getting a certificate from HPD and selling it to a market-rate developer. For a 20-year break, the owner has to provide on-site affordable housing. In other areas of the GEA, buildings qualify for 15-year exemptions with certificates and 25 years with on-site affordable units. Finally, outside of the GEA, there are no negotiable certificates: Buildings get 15-years of 421-a as of right and can secure 25 years if they provide affordable housing. 7) What does “affordable” mean? Buildings that get 421-a benefits based on the provision of affordable units have to set aside 20 percent of units as affordable. That typically means that they can be rented by families with incomes at 60 percent of Area Median Income, or $51,780 for a family of four. Some developments receiving substantial subsidies can aim for a broader income range, from 30 percent to 120 percent of AMI but they can’t average more than 90 percent of AMI, according to a report by the Manhattan borough president’s office. 8) How many affordable housing units has the program created? This is hard to pin down. One estimate, generated by ANHD, an organization that has sharply criticized the program, is that roughly 13,000 of the 153,000 units currently subsidized by 421-a were subject to affordability restrictions. 9) How can I find out if my building is covered by a 421-a exemption? Read this. Mayor de Blasio and leading developers back a reform package that would require affordable housing in every 421-a development (not just the ones in the GEA), mandate a higher percentage of affordable units and require a longer term of affordability. Some criticized the mayor’s plan as failing to address the root problem of 421-a—namely, that it partly subsidizes market-rate development—and for broadening the definition of “affordable” to include higher incomes. Unions and their allies (including the governor) have pushed a proposal to require 421-a projects to pay construction workers prevailing wages. Assemblyman Keith Wright, the key Democrat on housing issues in Albany, has introduced a plan to reform 421-a that mirrors much of de Blasio’s reform proposal but includes prevailing wages and a minority- and woman-owned businesses provision. And keep in mind, some critics want to see the program ended entirely because they view it as unsalvageable. Just a couple of other facts. The 2006-08 reforms designed to increase the production of affordable housing apparently had the opposite effect. Most of the units grandfathered in under the old rules were completed by around 2011 and the the number completed under 421a since then has declined.per a recent Independent Budget Office report. Also, of course, the only good excuse for a tax incentive is that taxes are too high. A recent Furman Center report noted that the rent for a one bedroom apartment in a new outer borough mid-rise has to cover about $1,200 a month in property taxes. Generally, property taxes on apartments in New York City are 5-6 times the taxes on similarly valued properties in other U.S. cities. Developers should pay taxes on the current value of the land, period. The existing buildings should also pay taxes on the value of the building and the property on which it stands. If renters were given a tax rebate on the rents they pay as well as a requirement of landowners to pay taxes on the value of what they owe, rents could normalize, property values would normalize and more working class New Yorkers could invest in their homesteads. Where is Bloomberg (he’s responsible for greedy developers trying to maintain their wealth on the backs of the working class New Yorker who is struggling to stay out of poverty)? Property near high valued real estate near train lines, Empire State Building, World Trade, other high revenue generation areas should pay taxes based on the value of those properties. Tax Abatement should have gone by the wayside by now for greedy developers. They’ve ruined the rest of the country with the cheap constructions of the buildings they build (where they charge high rents.) to collect profits. The chart is very helpful. There are Latinos in his administration, perhaps not enough Dominicans to suit the tide of the attitude of the typical Dominican. There are Puerto Ricans, South Americans, spanish speaking people in his administration, it’s working. Many people agree that New York City’s property tax system is marred by inequities and the unintended consequences of attempts to address them. But reforms could be costly or create winners and losers. As tenants rallied in Albany to call for saving and strengthening rent regulations, one Asssembly member called for changes to assist the overlooked regulated tenants of three non-NYC counties.